Amid a jumble of hills and indistinct horizons looms Monte Santo. From a distance it resembles an exclamation mark, a sheer rock spur, which proclaims kneel down before my sacrificial altar. It soars upwards from lopsided tableland, not unlike a massive meteorite that fell badly. The tableland slopes down to enclave terraces of houses in the foothills, the town trapped in its shadow. Only adventurers hoping for a silver ‘El Dorado’ would venture into a landmass that resembles the aftermath of an earthquake. Nevertheless, grace of an 18th century missionary, Apollonio de Todi, Monte Santo became a hermitage for religious enthusiasts. A hundred years later the army, needing a base to fight the Counsellor’s guerrillas, sought its protection. The prospectors would have been disappointed. The mountain is white quartz with bluish streaks of mica. Apollonio saw it as the reincarnation of Calvary. A freak of rock-formation engraves the summit with a natural-born cross. His vision was no mirage. The tableland is an oasis in the desert, the waterways underneath hydrate the drought. Apollonio’s followers settled on the sacred plateau, constructing shrines and shelters. The white chapel that Apollonio built perches on the rock spur, a granite hat raised to pilgrims. It was a safe haven for the army. Their bivouacs were sheltered from the cruelties of the sertão. The mountain is a bulwark that sieves sand from desert winds, and so the air on the tableland is relatively clear. And the water was more than a bonus. But a military redoubt has its imperatives. The tedium needs to be relieved by diversions, and Monte Santo became a garrison town with its bars and brothels. The cult followers reacted violently to the debauchery, and the town erupted into a religious war. Euclides da Cunha wrote ‘the mountain ran with blood.’ There were massacres, and the people fled to the coast, or into banditry. Human habitation is intermittent, the mountain a constant, eroding in aeons rather than epochs, a cruciform white granite beacon in a sterile plain. Apollonio wrote in his diary, ‘Bricks and mortar ruin. But who has heard of a ruined rock?’ The town itself has ruined badly. When the army disbanded the religious cults returned to build anew. But they turned their backs on the tableland. The blood of their own had run from it. The only chapel that remained on the mountain was Apollonio’s. 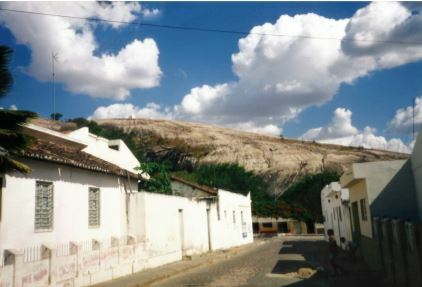 The cave cathedral of Bon Jesu de Lapa overtook Monte Santo in the pilgrimage stakes, and the town is now a desert, albeit with its oasis. Memory is short when it comes to survival. The town folk don’t scruple to draw water from the bloody slopes, and make their money out of Holy Week ceremonies (and fertility rites according to Paulo). In the main square a chapel with an ice-cream cone steeple faces a monument to Antonio, The Counsellor, ‘Soldier of Christ.’ The sand-blasted statue, twice life-size, in stone too hard to carve a human figure, replicates the rock spur, and yet it’s a fair representation of Euclides da Cunha’s description of Antonio. Tall as a rope hanging from a tree, craggy as a cactus, hair down to his heels, emaciated face, straggling beard, a piercing eye, blue canvas smock and a staff cut from a carob-tree. He walks without touching the ground, people said. When this prophet of doom, and Portuguese royalist, whipped up the drought-crazed peasants of the sertão, the revolt was against the New Republic in Rio. The might of the Government army was reduced to skirmishes in the caatinga chasing thistledown. The sertãnejos were heard not seen – the sha-sha-sha of leatherleggings swishing through brush. Soldiers vanished into the smoke of their own blunderbusses, and came out skinned alive by sertãnejos knives. Rampant, they stripped stragglers of their weapons, and uniforms, and sent them running naked into the thorny scrub. Only big guns blasting every bush in sight ended the rebellion, a genocide no one wanted. In the Lampion Museum in Salvador I was shown a sertãnejos knife: long as an arm and embossed with three gold rings. The blade had bullet marks. I also examined a typical leather hat of a bandit. It had two medallions on the band, one inscribed ‘The Lord be your guide,’ the other a miniature of Emperor Pedro II. The bullet-hole came out the other side. high noon and there’s nobody about. The molten pitch, I’d like to think, is a relic of army days, a trap set for the canon carts. I almost miss the cantina. It is caverned like a garage in the rock face of the mountain. The door is a curtain of shingle on twine. I walk through it. In the gloam, motionless men sit at the bar. The midday heat is only bearable by keeping still. Their silence is carved in stone, like bas-relief. I order rice and beans. It comes with manioc paste, black as clotted blood. Flies drop on the plate from the ceiling. I’m experienced enough to ignore them. This is watched approvingly by the bar-flies, particularly when I round off the meal with a one-shot cachaca. I ask about a hotel. Fingers are snapped, and a willing boy shows me the way. He answers my question about where the town gets its water with a nod to the mountain. And when I give him a dollar tip, he returns it to me. ‘Too much.’ I search out a cruzado note. ‘Too much too,’ but he takes it with a grown-up look. We shake hands. In the alcove of the Hotel Grande hammocks are slung, pregnant with sleepers. I ring the desk bell. An old man in a dressing gown sleepwalks me up several flights to an attic. I ask to see another room. His soulful, brown Bahian eyes say, ‘Trust me.’ I do, and nap for an hour. Thirst wakens me. But I don’t want to go back to the silent bar. This time I find one on the open side of the enclave. Indeed there are several adjacent bars and a night club, which suggests to me Monte Santo is two towns. One walled in by the mountain and given over to the sacred, and the other, Sodom and Gomorrah facing it down. I ask for a caipirinha, but the barman merely adds a double rum to a suco. Down the hatch in one shot (fortification needed to keep the mind clear). Through a window I eye the granite mass of Monte Santo, and its via sacra, a silvery stairway – part cobble-stones, part steps – bisecting the quartzite. This two-milepathway carved out of the mountain, almost two centuries ago, has been worn smooth by pilgrims, Lenten processions, stations of the cross. 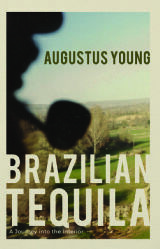 Extracted from Augustus Young’s very excellent new book Brazilian Tequila, available direct from the publisher or, of course, from Amazon.